The tzolk’in much more widely known now than it was a year ago. To people who did their research, at least, instead of mindlessly following the whole “Mayans predicted the end of the world” thing. Tzolk’in is one of the Mayan calendars, but not the one that allegedly heralded the apocalypse, that was the fault of the so-called Long Count calendar used for keeping track of historic events. Compared to the Long Count’s 5000-and-a-few year cycle, the tzolk’in lasts a much more manageable 260 days. Tzolk’in: The Mayan Calendar was published in 2012, but ignores all predictions of the coming apocalypse and is instead set in the safely historic times of the original Mayan empires. 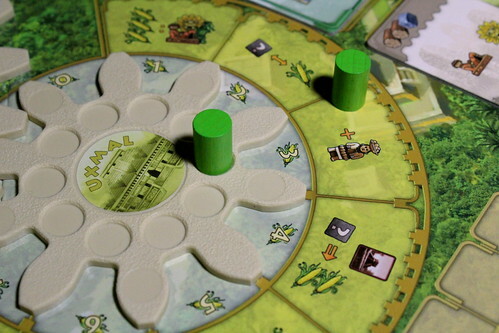 The tzolk’in itself is featured prominently on the game board as a large gear in the center of the board, surrounded by five smaller gears representing five important centers of Mayan culture. The tzolk’in gear not only literally moves the game along, it’s also the round counter, a game of Tzolk’in lasts exactly one revolution of the big gear. Fortunately, designers Daniele Tascini and Simone Luciani found a compromise between realism and playability: the tzolk’in gear has only 26 teeth, not 260. No matter how great a game is, if it lasted 260 rounds we’d be hard-pressed to find test players. Still, 26 rounds could make a long game, and it’s a blessing that one turn in Tzolk’in takes very little time. You only have two options, one of which you must pick: place one or more of your initially three workers on the city gears – the tzolk’in itself is not a place to put workers, who would put people on a calendar? – or remove one or more of your workers from the gears and take the action they are currently parked on. In the first round, your choice is even more limited: for lack of workers already on the board, you can only place workers. Placing one worker on the first spot on any of the wheels is free. If, and only if, the first spot on a wheel is occupied you may place your worker on the first free spot on that wheel and pay 1 corn for each spot you skipped. Slightly expensive, but it puts your worker closer to the much more profitable actions further along the gear. 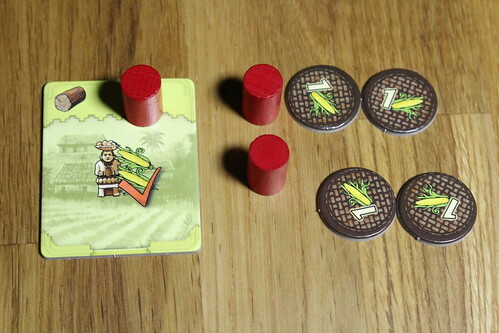 If you want to place more than one worker on one turn, each one beyond the first must be paid in corn as well: 1 corn for the second worker, two corn for the third and so on. Strategy tip: think hard before placing all your workers in the first round. If you do, your only option in round two is to take workers off before they reach the better actions. When every player had a turn, the tzolk’in advances and with it all the other gears. 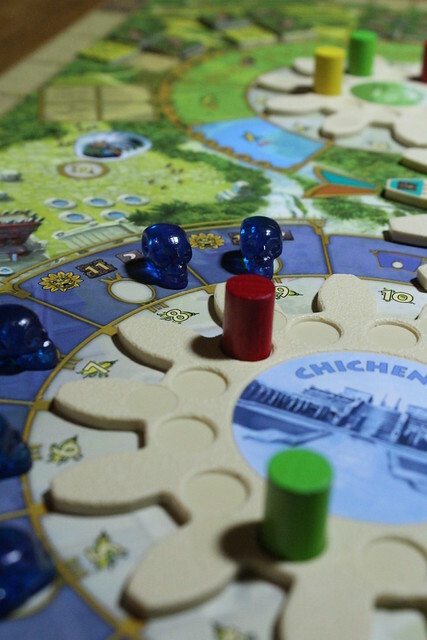 A lot of people expressed concern about Tzolk’in because of those gears, concerned that it might be a gimmick to add something special to a mediocre game. But there is no reason for concern, Tzolk’in would work without the gears and still be – wait, lets not jump to the conclusion yet. But without the gears, you’d have to move up to 24 worker pawns one step ahead after each round, then double-check if all pawns were indeed moved, argue whether or not all pawns are in the right place now or someone stealthily moved their pawns twice and then abort the game because of irreconcilable differences of opinion. Much easier to turn one gear and be done with it, especially since the mechanics – actual mechanics, not game mechanics – work flawlessly, nothing gets stuck and dislodges workers. Plus it’s more awesome to turn a gear as part of the game. 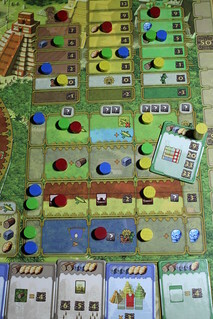 The point of the whole thing is not only to advance the round counter, turning the tzolk’in moves all workers forward towards the more powerful actions on their gear: the longer your worker stays still on a gear and lets himself be moved, the bigger the benefit when you finally take him from the wheel. Which is your other option starting from round two: remove workers. When removing workers, you may again take one, some or all of them in one turn, this time without extra payment, and then take the action each worker is currently standing on – or a lower one, but then you pay corn again. Each gear has a theme that its actions go with. Palenque is the agricultural center of the Mayan empire, all actions here give you corn or wood, the more advanced actions simply give you more. Each action space in Palenque only has a limited supply of wood and corn, and before corn can be harvested someone has to take wood first – you’re cutting down the jungle to make space for your fields. The Yaxchilan wheel is more reliable than that, here you harvest all other resources. In order of the actions your workers can get: wood, stone, gold, a crystal skull or stone and gold in one turn. This order also mirrors roughly how valuable each resource is in the game – if you use them right, of course, just having enough gold is no guarantee for victory. While the first two gears are all about gathering resources, the others give you opportunities to spend them. In Tikal you can develop your technologies or erect buildings and monuments. The four technologies each improve one type of action in three steps, each step obviously more powerful and more expensive than the previous one. Agriculture is all about getting more corn for your actions, Resource Extraction improves your yield when gathering other resources, Architecture gives you benefits when building and theology improves your standing with the gods and the value of the crystal skulls. Each level of technology is a powerful bonus when you use it right, but doing a lot of research is no guarantee for victory. 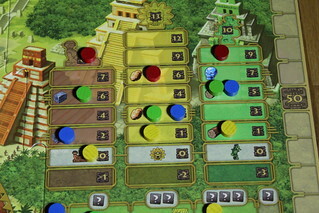 Also in Tikal, you can build: most regular buildings give you a one time bonus when you build them – resources, free levels of research or favour with one or more more of the gods – the yellow farms instead help you feed your workers when Food Day comes. You can also build more impressive Monuments: only a few of these powerful buildings are available in each game and their only effect is a bunch of victory points when the game ends – victory points for your technology, victory points for the workers you have, victory points for your favour with the gods. But while having the right monuments is worth a bunch of points, it’s no guarantee for victory. As a final option in Tikal, you can pay one resource cube to advance in favour with two of the three gods. On Food Day, favour with the gods either lets you have extra resources or victory points. Being in the gods favour is very beneficial, but, you guessed it by now, no guarantee for victory. The next gear, Uxmal is more of a what-didn’t-fit-elsewhere locations. You can trade corn into other resources and vice versa, buy the gods favour with corn or take any action from this wheel or the previous ones at the cost of one corn. This is a very convenient action because it is possible to – intentionally or unintentionally – become locked out from an action you really needed by other players taking all the spots. Uxmal is a very useful way around that. Also in Uxmal you may hire up to three additional workers. In any other worker placement game, you’d see me rushing for those three guys as soon as the game starts, but Tzolk’in makes this decision refreshingly less obvious. Sure, having more workers lets you do more stuff, but you also have to feed them four times during the game. Having more workers has it’s advantages. So does having less. Neither is a guarantee for victory. And finally, Chichen Itza, spiritual center of the Maya. All actions here do essentially the same, only more so the longer you wait for them: you can unload a crystal skull on an action space to gain victory points, favour with one of the gods and sometimes a bonus resource. The skull stays on the action space, so each action can only be taken once. Even with four players, the space is usually sufficient, but snagging the highest actions with up to 13 victory points first makes a big difference. Unloading a few crystal skulls early is a good start, but not a guarantee for victory. Four times during the game, it’s Food Day – every one of your workers demands two corn for his services now, and you’d better be able to pay them or have build some farms that feed workers by themselves. Every worker you can’t feed costs you three points and not having enough corn on Food Day is, if not a guarantee, then at least a strong indicator against victory. There is one more possible move in Tzolk’in that can be used to bring your opponents into serious Food Day trouble. There is exactly one worker spot on the board that is not on the gear: the start player space. Place a worker here and, at the end of the round, you become the new start player. When that happens the new start player may chose to advance the tzolk’in by two teeth instead of one – devastating when done to bring Food Day one round early and no one is prepared. Besides the feeding, Food Day is also when you gain victory points or resources depending on your favour with the gods. After the fourth Food Day, the game ends, some final points are added based on left-over resources and Monuments and winner is found. Who that will be is usually open until late in the game, a good move in the last few rounds can catapult you forward on the victory points track. Deliver three skulls to Chichen Itza within two rounds, win the points for that, the points for the God’s Favour you gained and pay for a Monument on the last round with the resources this got you and the previous leader will look at you in anger and disgust. But that doesn’t make the early game unimportant, a move like that has to be prepared and doesn’t win the game all by itself, either. There is also, as you probably gathered from the review so far, no guaranteed route to victory except playing better than the others. There are many ways to gain points, but none of them is stronger than the others, everything is well-balanced. We had winners that only went for the favour of the gods, winners that concentrated on crystal skulls winners with mixed strategies, all are valid options when played right. More so than in other worker-placement games, “played right” means coordinating your actions: you want to arrive on the actions you want at the same time so you can use them all at once instead of taking multiple turns. Which strategy will work best depends on some factors, however: the available monuments come into it, of course, they may give a big boost to some strategies. Your starting resources do: they are semi-randomly distributed, you pick two out of four resource chits before the game starts, giving you the regular resources, but also sometimes Technology or Favour that may influence your path from the start. Player order in the first round is important since some moves in the first round are unlikely to be available to the fourth player, being completely occupied by the others. Small bit of strategy advice: when you’re the last player, pick a lot of corn with your resources. That will let you skip over the other player’s workers and give you the more powerful actions early in the game. Last, but not least, the other players’ strategies should factor into yours. While there is no direct interaction like trade or alliances in Tzolk’in, the competition for spots on the gears can be harsh and if you find yourself permanently locked out from what you want to do, you will have to change your approach or perish. This last bit holds true with less than four players as well as unused workers are randomly distributed across the gears. It’s not quite the same as having the full four players, but it leaves you with a similar amount of space to act in and keeps the game from being too easy. All my fears that Tzolk’in might be “that gimmicky game with the gears” have been thoroughly laid to rest. The gears are a neat, unique feature, but they are just one part of a very tense and strategic worker placement game with no luck involved beyond the setup and starting resources. 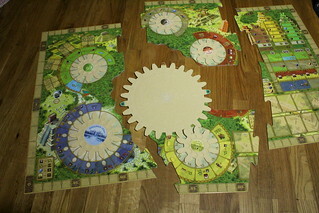 The gears also don’t pose any problem for building and unbuilding the game: the board disassembles and folds cleverly into four (very irregular) parts that fit the box with gears still attached. From gears to gameplay, Tzolk’in: The Mayan Calendar is a brilliant worker placement game and, in my opinion, an early candidate for Kennerspiel des Jahres 2013 through its German edition from Heidelberger. If the apocalypse isn’t still coming, maybe we read the Long Count wrong.